The following is Part Three of a three part series. Its launching point (click here for Part I and Part II) was an analysis of the commandment to “be fruitful and multiply” spoken once to Adam and a second time to Noah. Through careful exploration of the two, numerous conclusions about our existential state, our purpose and leadership styles have been drawn. Now we turn to applying all that has been discussed to the different modalities of men and women. I don’t know what became of them – the matriyoshki that lined my Bubby’s bookcase. These were not post glasnost cheapskate reproductions. 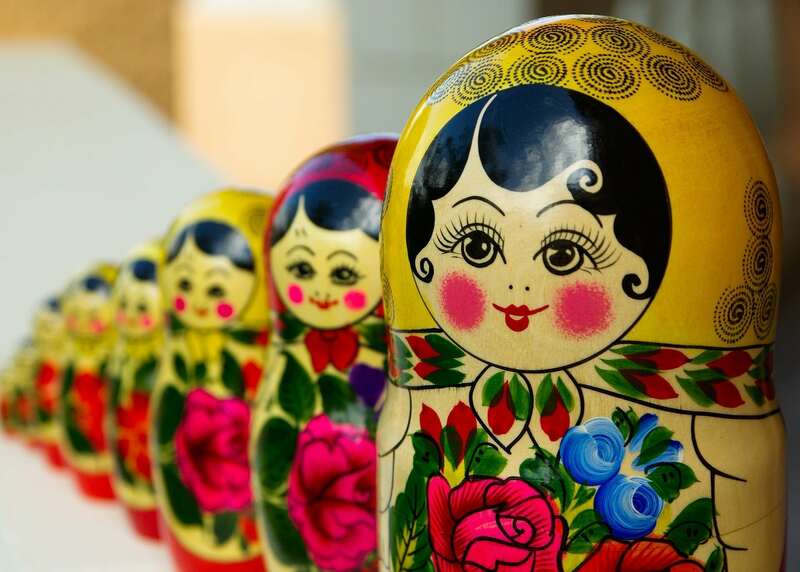 Sturdy and painted in rich colors – emerald, crimson, gold…thick and glossy – each antique wooden doll fitted comfortably within the next Mama up on the scale. I loved to play with them, sweeping the set off the shelf and enclosing one within her mother until all that stood before me was the ancient matriarch of the set. Silent. Robust. Red. Fat and pregnant with maybe fifteen smaller versions of herself. Then I’d begin the unpacking, delighting at the birth of an identical but smaller doll. How does this apply to our current exploration of the two verses spoken to Adam and Noah commanding them to be fruitful and multiply? We explained them as respectively framing a Genesis reality and the post-flood gestalt. (See Braving a New World – Part 1) We have also explored their correlation to top-down and bottom-up models of leadership. Monarchy and grass-roots change. (See Braving a New World – Part 2) Or coercion and co-opting if you will. What I am suggesting is that all these concepts can be “stacked” one within the other. And that itself is possible because each construct parallels the G-dly underpinnings of existence: Within the Creator are, so to speak, the aspects of influencer and recipient. Stacked within those two modalities are Genesis-subjugation and Flood-transformation. And placed inside of that are two modalities in leadership, the monarch and the grass-roots activist. Into this set of concepts fits another one: Male and Female ways of being. Our focus here is to explore them and just how they stack into the larger picture. Before we get into the meat of the discussion, I’d like to establish something up front. Discussions like this can become partisan and they can also result in two-dimensional caricatures of what defines being male or female. It is important to remember that the concepts outlined below are generalities. Across a broad spectrum, they do apply. But there is a vast range of subtlety in their application. There are even individuals who seem to epitomize the very opposite of the standards we will set up. This is not only to be expected but a positive indication of the breadth of human nature. In addition, we must constantly bear in mind that Jewish mysticism teaches us that within each of us is our own inner male and female (child too – but that’s for another time.) As you read, you will hopefully recognize attributes in yourself. Some from the “way of the man” and others from the “way of the woman.” Both are there, working their program within your heart and psyche. And just as understanding the way men and women operate can help in interpersonal relationships, so too understanding what these modalities embody can help each of us to attain an inner peacefulness as we learn to negotiate between our masculine and feminine impulses. A key difference between the sexes is to be found in a commentary of the first verse. Rashi, who articulates the smoothest reading of the Torah, comments on the verse from Genesis. As we have said, it is the verse that communicates G-d’s mission statement to the first human being. Adam is told, “…Be fruitful and multiply, fill the earth and subdue it…” Rashi is struck by the word “subdue (it. )” He clearly bears in mind a teaching from the Talmud which tells us that the act of conquering and subduing is predominantly masculine. “A man’s way is to conquer,” say our sages, meaning in that specific context that it is men who go out to war. Rashi applies this reading of the word “subdue” to our verse and deduces that just as it is men who go out to war and conquer, so is it men who are commanded to “be fruitful and multiply, fill the earth and subdue it.” The implication is that a woman is not obligated to have children. It seems bizarre to say a woman is excluded from the concept of birthing! After all, not only can it not happen without her egg but she is the one who develops the fetus over a nine month period in utero. To accurately understand what is being said here, to avoid any “flood” of confusion, we must step into an “ark” of a different kind: Our sages teach us that the words of Torah are comparable to a sanctuary that protects us from the raging waters of life and of confusion. Before reaching a foregone conclusion it would be best to “brave a new world” and try on a different way of thinking, to take a close look at precisely what is meant by the statement before we dismiss or take issue with it. First off, Rashi’s statement does not exclude women from the concept of “be fruitful and multiply.” Such a thought is impossible because the command was a general one given after the creation of Adam and Eve. It was spoken to both of them. As such, it includes not only Eve but all women (and men), since all couples are descended from the first couple. The import of Rashi’s commentary is that a woman is not obligated to have children but she is certainly not out of that loop. It is not only this narrower sense of the verse that applies across the board. According to the same logic, one must also necessarily say that the verse in its larger sense applies to women as well, namely the mission to be fruitful metaphorically, filling the world with good deeds and multiplying the manifestation of G-d’s presence. Taking this a step further, by the same token women are also included in the concept of “subduing.” In fact it applies so fully that our sages debate whether a woman is required to participate in a defensive war, some holding that she is and others that she is not required. It is obvious then that women are expected to engage in a spiritual service akin to “subduing” or “conquering.” Furthermore, our Creator builds each of us with the required components and dimensions to successfully fulfill our mission here. This all adds up to the fact that women have both the obligation and the ability to engage in “conquering.” The question is what exactly does that mean? According to Torah, the primary power base of a woman, the place where she is blessed with miraculous, rather than natural success, is the home. Of course in contemporary society women have taken a role in many public forums from politics to the workplace to social advocacy and beyond. But nonetheless, her point of departure is in the private, uncompromised domain of her inner world and the home she inhabits. The power of the home is something our current thinking has lost touch with. We live in an era when eating out is the norm, when bathrooms are larger than kitchens, and when “latch-key” kids are far too common. In fact, according to the U.S. Census Bureau, one third of all school age children in the United States are, for some part of the week “latch-key” kids; that is they go home to an empty house or apartment. One half of all children in the country age twelve to fourteen are home alone an average of seven hours a week. And many parents identify themselves with their careers more than with their roles as fathers or mothers. What this all boils down to is a society that decries the crisis many of our youth find themselves in, and yet simultaneously seems to want to solve those problems in absentia, resisting a return to the source, the home. If we think about it in a way that is free of cultural trends, the home is logically the primary building block of a society. Our sages say, “A person is not a person without a home.” It is the most powerful center of learning for a human being. The values and lifestyle that children see modeled there will become the basis for their conduct and values as adults. Judaism understands that real societal change starts with one particular individual living in a particular household. This happens regardless of who’s president and what governmental policies are implemented to bring about change. The home is the building block of society. It is the first model of grass-roots, bottom-up influence. In actuality, all conquering and subduing starts at this grass-roots level. Take for example the way a leader conquers either the hearts of the people or the lands in which they live. He must first subdue his own state and only then can he expand to others. It is a foolish king who would attempt to conquer other countries before his own. Along identical lines we are taught that the outside of the windows of the holy Temple were broader than their inner opening. This is contrary to the architectural aim to bring more rather than less light into a physical space. The reason for the reversal here is that the Temple was built not to receive but to be a source of light and insight for the entire world. It is the archetypical “home” and is built such that its radiance shines outward. The same applies to the private home of any individual or family. Here is where the bedrock lies, where real shifts happen. And it all begins with a woman. She is the first conqueror. Only once her influence has been established, once she has subdued, tamed and aligned the space on the other side of the “Welcome” mat, can that consciousness effectively move outwards to the world at large, whether through her own actions or the impact of the family members she lives with. What this all boils down to is that Rashi in his reading of the text is addressing the different styles of men and women. As mentioned above, his interpretation cannot to be understood as an exclusion of women’s involvement in having children – or engaging in the spiritual service of transforming this world into a space where G-d’s presence is experienced empirically. Rather the meaning of those words is to articulate that there is a difference in the manner in which men and women go about the business of subduing the world and making it a dwelling place for G-d.
What then is the difference in their modalities? The literal meaning of “conquer” is to force someone to do something against his or her will, to go out against the other in war with both strength and vigor. Even if we take the Hebrew word to mean “subdue” or “restrain,” even to “pacify,” we are still looking at a dynamic where one person impacts his or her will on another. This is seen both in Talmudic teachings and in the Kabbala as being a male orientation. In our analogy of the matriyoshki, the “way of the man” fits neatly into the top-down model of leadership and then again into the bigger model of the Genesis subjugation by which the world operated until the cleansing of the flood which in turn can be placed within the overarching dynamic of the “male” aspect of the Creator, G-d as influencer. But that is not the way of woman. We are taught “the glory of a king’s daughter is (her) inwardness.” Hers is a path of dialogue and reconciliation. As sociolinguist Debora Tannen says, men speak in terms of do’s and don’ts whilst women say “let’s.” “Let’s play together.” “Let’s go out.” Their unconscious, in-built orientation is to connect with others and offer them a paradigm shift, genuinely bringing them over to her point of view, co-opting the listener onto the bandwagon. In terms of our matriyoshki, the “way of the woman” fits snugly into the grass-roots model of government, then the bigger construct of post-flood transformation and ultimately into the mystic dimension of G-d as recipient, the realm of the sacred Shechina. Undoubtedly women encounter stiff opposition: Internal resistance, a spouse who resists change, a new co-worker who is bristling with envy, a committee that’s stuck in an old and boring way of solving problems. We’re talking about a world that is not receptive, and then having to step in and try to transform and work that reality into a home for G-d. So “subduing” is something she must do. And women do it daily. But it happens in an inner way, both in the sense of “in the confines of her home” and in terms of her inner world and self-contained way of being. Here her manner is devoid of force or sharpness but full of inner refinement. It is also a way of “glory” characterized by respect, honor and peacefulness. Having entered into the “ark” of Torah, we can now go back and address why a woman is not commanded to have children. The omission is a testimony to the nature of women. G-d interacts with us according to who we are. Being that a man’s way is to operate with force, he needs to be commanded to do things. “Have children,” G-d tells him. “Make this world a civilized and G-dly place.” It’s a do-this do-that kind of interaction. On the other hand, a woman, who’s way is more gentle and receptive, does not need a direct imperative. She absorbs that command into her being from her husband, much as Eve received G-d’s mission statement from Adam. This duality applies not only to their obligation to have children but also to their broader manner of serving G-d.
At an even deeper level, one can say that women are not given a command to have children because doing so is intimately connected with who she is. Certainly there are women who choose not to have children or who very much want a child but have not yet been blessed to give birth. Whatever our respective circumstances, women are perceived in Kabbala as agents of birth. Men, if left to their own devices, might not decide to “settle down,” get married, have kids, the whole shebang. They might not proactively set about being fruitful and multiplying in the metaphoric sense of the word either. Therefore they need a command that comes from outside of themselves. Conversely , women innately yearn for the birthing (whether physical or metaphoric) that G-d asks of us. As such, they don’t need a command from an outside source. From all that has been said, it becomes obvious that not only is there no lack in the way of a woman apropos a man but quite the contrary, her approach has an advantage over his. The outwardly directed force of war, the male attributes of strength and power, are at times connected with arrogance. This coupled with a tendency to domineer a situation, alienates the very people a man may be trying to reach. Conversely a woman has the ability to touch and reach people more effectively because she engages with others in a way that invites them in. She allows them space to be present and to process whatever’s on the table. Her inborn bent (albeit she certainly has the free choice to corrupt it) is to speak with respect and dignity, in a pleasant and peaceful manner. As such others willingly accept her influence and change from within. They’re different even when she’s not around imposing her perspective. Empirically it’s obvious that a “female” modality of bringing about change is more successful. Men have much to gain from modeling their conduct on that of women in this respect for even when they give rebuke or perform the more “stern” acts they might be involved in, it must be done with kindness and honor of the dignity of others. In recent generations women have taken on roles outside of the home as well. They bring to the workplace, or any environment they engage in, a new and alternative way of doing business. They bring to the “outside” their innerness and thereby pave the way for others to shift into a space where transformation can happen, effectively heralding the Messianic era when the voice of the feminine will be of paramount importance. We will then be able to place all the matriyoshki in their rightful place, opening and closing them at will as we traverse the universe and its meanings, accurately aligning constructs, living according to those truths and being able, finally, to manifest the full scope of our inner male, female and child. The concepts and flow of ideas is excerpted from an address of the Lubavitcher Rebbe on Parshat Noah, 5751 (see Sefer HaSichot 5751 volume 1, Parshat Noah). Much of the scholarly analysis in this section has been omitted and I have included analogies that were not in the original talk. Genesis presents us with two accounts of the creation of Adam and Eve. The first tells us that G-d created Adam (singular) and then immediately says, “male and female He created them.” From this our sages learn that the first human was originally a hermaphrodite with two heads. The second tells us that G-d first created Adam – man – and then after putting him to sleep, built woman from one of his ribs. Whichever reading we start with, it is obvious that Eve is “included” within her partner. As such, any commandment spoken to Adam applies to her. The same holds true for all the men and women who are born from the first couple. Le’Ohr HaHalacha, Rab S.Y. Zevin, p. 25 ff. In Part 1 of this series, footnote 10, we discussed that the transformation of the Flood began with just one person, Noah. And in footnote 17 we brought an example from Jewish mysticism discussing the dimensions of the ark as a metaphor for the notion that we must always first activate change by focusing on our circle of influence and then expanding to our circle of concern. See there. Psalms 45:14. The verse is most commonly translated to mean, “The glory of the King’s daughter is within.” This translation captures the reading of the verse as describing the physical confines of the actual space in which a woman finds herself. Here she is the “mainstay of the home.” A second translation renders the meaning to be, “The glory of the King’s daughter is her inwardness.” This refers to her internal world and contained way of being. Her inner way is described as being one that is “pleasant.” In Aramaic the word for “pleasant” is naicha. It is etymologically related to the Biblical word for Noah, Noach. The parallel in language brings into focus the commonality of approach that characterizes both women and post-flood reality. Another mystical association between the two is contained in the idea that Noah brought peace to the world. This state of restfulness is associated with the day of rest, the Sabbath, which is in turn associated with the mystical sphere of Malchut, in turn bound up with women and the feminine in all things. It reminds me, no matter how seemingly mundane the chores at home may seem, this is where it all begins, and how I conduct myself matters, profoundly. Thank you for this.